If there is such a thing as Hot Hatch Top Trumps, the new Vauxhall Corsa VXR is the card that everyone will want to be dealt. Peak power is 205PS, peak torque is 280Nm and 0-60mph takes just 6.5 seconds. But not all the numbers are bigger with the new VXR - prices now start at £17,995 - a cut of £1000 versus the previous, less powerful model and on par with the benchmark Ford Fiesta ST.
And, as the numbers suggest, it is a very rapid little car. The 1.6-litre engine is the same as in the outgoing Corsa VXR, but technical tweaks give 245Nm of torque from 1900-5800rpm, rising to 280Nm with an overboost feature that provides five seconds of extra torque when overtaking or getting up to speed. On the road this means there is plenty of grunt on tap almost regardless of gear, you just press the pedal and go. Every VXR comes with a set of clever Koni ‘Frequency Selective Dampers’ that adjust passively to the road, which means the ride is very firm, but never so much to be jarring and uncomfortable, save for over speed bumps and the very worst of potholes. As you would expect there is very little in the way of body roll through corners, even on rough roads. Indeed, grip is tremendous, even on poor surfaces, but it isn’t all good news. 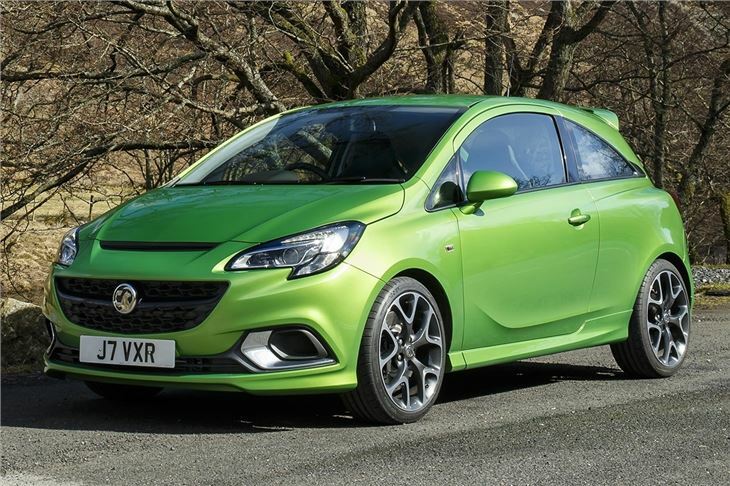 The Corsa VXR suffers from constant torque steer, with the front wheels struggling to cope with all that power. As a result, the car tends to squirm under hard acceleration or out of bends, tugging left and right. It isn’t violent, but it is ever present and it can be a little disconcerting, especially when it catches you off-guard. Vauxhall does offer a solution in the form of a Performance Pack, costing an extra £2400. This includes dampers with the firmness dialled up, more powerful Brembo brakes and, most importantly, a Drexler differential designed to tame the front wheels. It is especially noticeable when exiting corners, where it tugs the car into line rather than letting the front wheels lose grip and run wide. It’s great for setting fast lap times on a track day. Unfortunately it isn’t so good when you’re driving on your favourite country lane - it is simply too invasive and too fierce. You have to constantly be aware of your steering inputs because the car unnaturally tugs the wheel when you get on the throttle through corners or even, albeit to a lesser extent, in a straight line, particularly if the road isn't completely flat. Arguably it is part of the car’s fiery character - something VXR models are known for. And yet, despite being an angry little car, it struggles to stir the soul. Vauxhall worked with exhaust manufacturer Remus to tune the sound, even going so far as to make it as loud as is legally permitted, but it’s just noise for the sake of noise - it isn’t particularly pleasant or tuneful. The cabin disappoints too. The supportive seats are great but there’s not much else to set the VXR apart from lesser Corsa models. It is neatly laid out and well-finished, but you would expect something more vibrant and aggressive. In fact the only things that really stand out are the bucket seats and a VXR-specific gear-lever, complete with the red and white logo. On the plus side, kit is plentiful. There is handy equipment for everyday driving, including a touchscreen system, Bluetooth, cruise control and a heated windscreen, plus you also get typically VXR styling. There are aggressive bumpers, a bonnet vent, a big spoiler and the aforementioned twin exit Remus exhausts and Recaro seats. Being a Corsa it’s sensible enough, too - boot space is sufficient for a family shopping trip and running costs are respectable when you consider the performance. Official fuel economy is 37.7mpg and, if you don’t spend all of your time with your foot buried in the carpet, it’s possible to come reasonably close in reality. Less palatable is the 174g/km emissions figure, which equates to band H for road tax. Objectively, despite some flaws, all of the important boxes are all ticked. It is cheaper than the outgoing car, it trumps rival hot hatches like the 182PS Fiesta ST and 202PS Renaultsport Clio for power, it has clever technology, plus there is little doubt it will set some blistering times at a track day. And yet it lacks the joyful poise and immediately likable charisma of its arch-nemesis, the Ford Fiesta ST. In fact it just feels like a very fast Corsa - which it is, obviously. But a hot hatch should have some extra magic that makes it more than the sum of its parts. Unfortunately that secret ingredient is missing from the VXR. Buyers will no doubt enjoy it and it has what it takes to deliver excitement - but it isn’t the best hot hatch money can buy, even with its more competitive price tag.